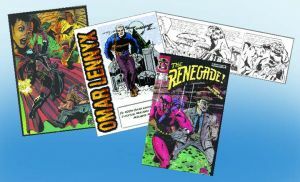 Professional comic book illustrator Sterling Clark became fascinated by comic books as soon as he was able to read. He was first exposed to them at local drug stores, department stores and vending machines. His favorites were published by Marvel Comics and included Spider-Man, Captain America, The Mighty Thor, Iron Man, The Incredible Hulk and The Fantastic Four. "When I was coming up and reading comic books in the 70s, they were really starting to take off into a really commercial vein. It was kind of easy to get into comic books and the superhero genre back then," Clark explains. "I never really got into Archie comics." When comic book superheros made their way to television, Clark was just as fond of those programs as he was of the printed versions. "When I was growing up in Cleveland, the local television stations would play the syndicated Spider-Man cartoons and Speed Racer and Ultraman," Clark recalls. One thing that wasn't around back then were all of the fancy action figures that seem to crowd toy stores nowadays and go hand-in-hand with any cartoon or film dealing with superheros. But, Clark made do with his very own set of toys that he created from scratch. "I used to take a comic book cover, trace it and cut it out and those were my action figures back then. That was how I got involved drawing the characters," Clark reveals. "As I got older and started to read the comics more, I paid attention to who was writing and drawing them. I became familiar with Jack Kirby, Gil Kane, Sal Buscema and John Buscema because their names were always in front of me." Those names might not seem instantly familiar to many people, but according to Clark, they were the early heavy hitters in the world of comic books. Their groundwork led to what is known as the Marvel Universe. "Kirby pretty much co-created the Marvel Universe and Sal Buscema was a freelancer, but he was with them for many years," Clark explains. "Stan Lee is the founder of Marvel and he puts his stamp out there and makes himself known. He wasn't an artist; he was more of a co-creator. He would create characters and then have the other guys create the look and feel of them. He had a big hand in it, though." After being inspired by the men who created Marvel and the characters that inhabited the Marvel Universe, Clark began creating characters of his very own. The first one, Renegade, was an homage to both Spider-Man and Daredevil. Another Clark creation, Omar Lennyx, is a paranormal investigator who chases vampires. "Both characters were created in 1987, but neither one really took off until the 90s," Clark says. "I was able to professionally produce a couple of comic books for Rip Off Press. They're kind of known for doing adult-oriented work, but they published my work as a way of offering material for all ages." Then Clark took on an assignment that ended up becoming his first big-paying job. It was for one page of work. "I did a pin-up, an image that fits an entire comic book page, for Todd McFarlane. He worked for Marvel in the 80s, before starting his own company, Image, and creating Spawn. I faxed a few things to him around 1991, and eventually did a pin-up in issue 21 of Spawn in 1994." Clark says that once he has the image and gets it out of his head and on to the page, not much time has gone by. But, comic books as a whole take quite a bit of time to put together. "They are sort of like an assembly line," offers Clark, "You've got the writer who comes up with the plot. You've got the artist who interprets that art. Then the art gets shipped off to an inker who will ink it. Then someone puts the letters and words in and then someone colors it. I would imagine that process would take a few weeks for a monthly comic book." The Kokomo, Indiana based artist’s latest project is creating an adventure strip that will run weekly in INK next year. It focuses on a character named Ntombinde. The strip, Ntombinde: The Girl Who Loves Danger, will begin running in January 2009 and Clark says that he already has a year's worth of stories written. “The idea came from a book I wrote and illustrated in 2005 titled Tales From the Motherland,” Clark says. “I wanted to do a comic book and while I was doing research on mythology, I realized that there was a lot of African mythology that no one had ever tapped into for a comic book. I took some of the more well known stories, like Anansi the spider god, and turned them into a book that I did for myself, really. I made 80 copies, had them printed locally and they sold pretty well. I sent it out to California for a contest that the Do It Yourself Association of Independent Artists was having and it won in its category in 2006." Clark says that if the comic takes off like he hopes it will, he has plans to introduce another character of his somewhere down the line. "I've got a story that includes Lennyx, so that would be neat to have him running around in there." The typical comic strip is three panels, but Clark says that due to the space allowed he will be combining two strips into one and the full color strip will look more like a Sunday comic. Clark doesn't really keep up with any of the Sunday comics or many comic books these days. He says he has too many of the older strips and no room for the new stuff. "Something has to really catch my eye," he admits, before offering, "I keep up with Hellboy." He also spends as much time at comic conventions as he can, but not as a spectator. "I have a table set up and I sell my books, pin-ups and t-shirts. They go on all year long." With all of the comic book films being released these days, it's more than likely up and coming artists are being drawn to the world of comic book illustration, but Clark has one very important piece of advice to offer. “If it's really something that you want to do, you have to pursue it hard and heavy. Learn the craft and learn how to draw from life first. Draw regular people and things, like buildings, cars and backgrounds. A comic is like a movie on paper and you've got to be able to draw the essentials before you can draw the superheros." 15 people	reviwed this story with an average rating of 4.9.